In a wide-ranging press conference Friday at the White House, President Barack Obama continued his attack on Republicans for failing to take action to help get the nation's stalled economic recovery going again. In opening remarks, the president chastised Republicans for not acting on a small-business jobs bill "that's been held up in the Senate by a partisan minority," the president said. Obama said he understood that lawmakers may have philosophical differences in some areas, but "this should not (be) and is not one of those issues." The bill, which Obama said could pass "next week," would eliminate capital gains taxes for 1 million small businesses and provide incentives to some 4 million small-business owners to invest and create jobs. The legislation would also improve small-business owners' access to loans to help grow their businesses. Further, Obama said the bill is paid for, won't add to the nation's deficit and was written by both Democrats and Republicans. "And yet a minority of Republican senators have been using legislative tactics to prevent the bill from even getting to a vote." The president praised comments made Thursday by Sen. George Voinovich in which the Ohio lawmaker said he could no longer support fellow Republican efforts to delay the measure in hopes of winning the right to offer more amendments. Most of the proposed GOP amendments "didn't have anything to do with the bill" anyway, Voinovich told The Washington Post. While acknowledging that midterm elections are just weeks away, Obama nonetheless said Republicans shouldn't be holding the bill hostage to election-year politics. "The American people didn't send us here to think about our jobs; they sent us here to think about theirs," the president said, noting that some small businesses are holding off hiring because of the stalled bill. Obama also named Austan Goolsbee to head the White House Council of Economic Advisers, replacing outgoing chairwoman Christina Romer, who resigned the post last week and is returning to private life in California. In naming the former University of Chicago professor, Obama said Goolsbee wasn't "just a brilliant economist, he's someone who has a deep appreciation of how the economy affects everyday people." Asked by a reporter whether the outcome of this fall's elections might be interpreted as a referendum on the economy, the president acknowledged that the economy isn't where it needs to be. Still, he said, "If the election is about the policies that are going to move us forward versus the policies that will get us back into a mess, then I think the Democrats will do very well." Middle-class families have been struggling for a decade as wages and incomes flat lined as they watched health-care and other costs accelerate, Obama said. But his administration has put in place policies, such as health-car reform and financial regulation overhaul, designed to help the middle class. "The policies that we have put in place have moved us in the right direction," he said. 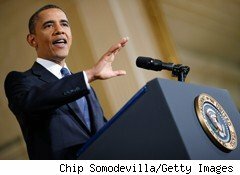 Meanwhile, Obama said, Republicans, in seeking to continue Bush-era tax cuts for the wealthy are holding "hostage" the president's proposal to provide middle-class tax relief to those who earn $250,000 a year or less. Those who earn more than that, the president said, would still lower tax rates on the first $250,000 in income. The Republicans proposal would lessen the tax burden on high-income earners by about $100,000 a year, "which would cost, over the course of 10 years, $700 billion," Obama said. Providing the middle class tax relief is an "area of agreement" between the parties, the president said. "Why hold it up? Why hold the middle class hostage?" The president was also asked why his administration waited until this week -- amid the overheated campaign season -- to roll out a new $50 billion plan to stimulate the economy. The president said in the weeks after his swearing in 2009 his team put together an economic plan that kept the nation from going headlong into depression and cut taxes on small businesses eight times during the last 18 months. "So we're hardly Johnny-come-latelys on this issue," he said. Obama said the plan has made a difference, noting that some 3 million jobs were saved. If not for the $800 billion stimulus, "the economy would be in much worse shape," he said. Still, Obama said, the economy isn't yet where it needs to be and more needs to be done. The package of proposals, which include tax credits to businesses for research and development and spending on roads, bridges and other infrastructure, typically in the past have garnered bipartisan support. "This notion that we waited until now to put forward a series of plans" is wrong, he said. The president was also asked whether Elizabeth Warren is still a leading candidate to head the new Bureau of Consumer Financial Protection Bureau, created by the financial overhaul legislation he signed into law in July. Warren, who spearheaded the bureau's creation, is popular among consumer advocates but conventional wisdom suggests she would have a hard time being confirmed by the Senate. Obama said he has had conversations with Warren about the job, but wouldn't yet comment on whether he will nominate her, saying, "I'll have an announcement soon about how we're going to move forward."